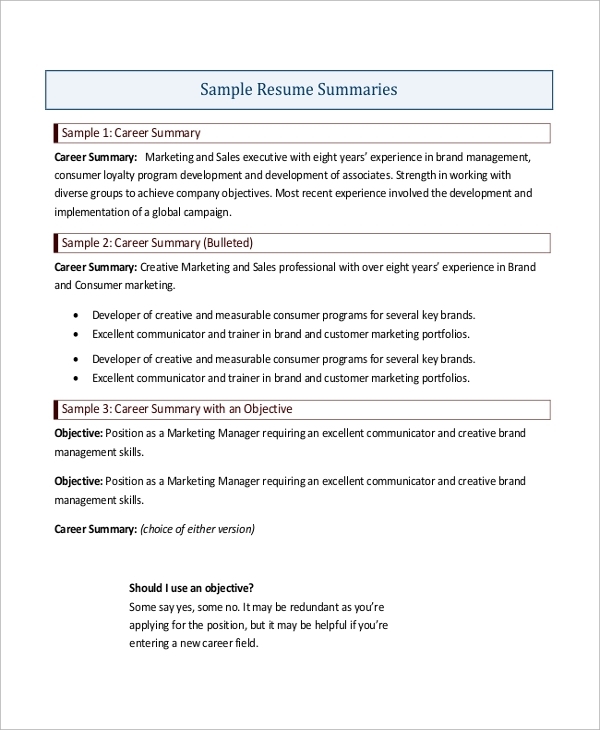 Summary for a resume is a crucial part, and sometimes it covers the entire resume in summary form. For most of the good resumes, professional summaries are mandatory, and they are excellent to read. They capture the attention at once and intrigue the reader to read out the entire resume in one go. A good summary increases the chance of selection. 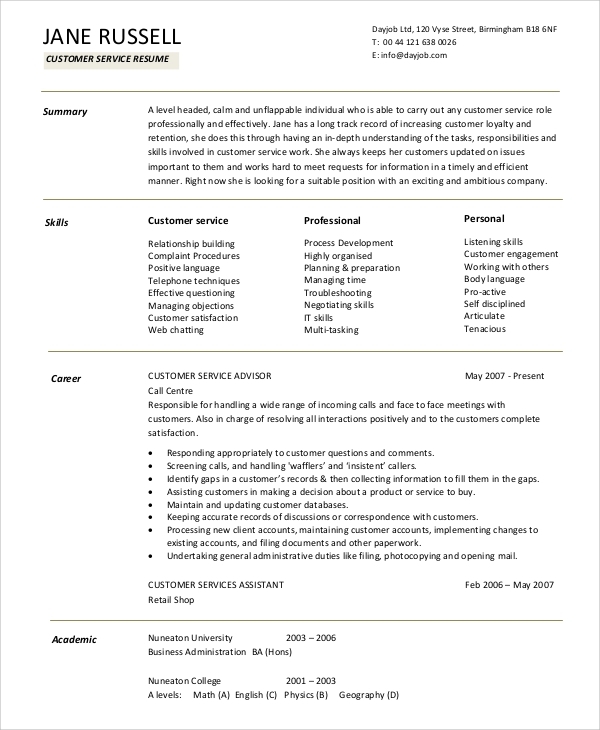 The following summary for resume has provided all the required instructions and steps to write an awesome summary.The Sample Resumes will give you plenty of ideas to create a stellar resume summary for yourself. 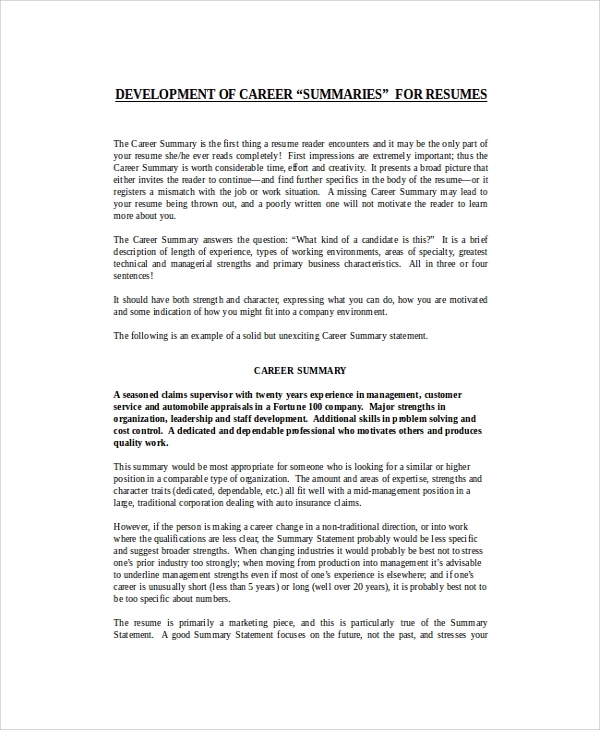 This is a collection of summaries which consist of personal summary, professional summary, work experience summary, qualification summary, and several such relevant resume summaries. It gives a complete idea about how to write a perfect resume summary. 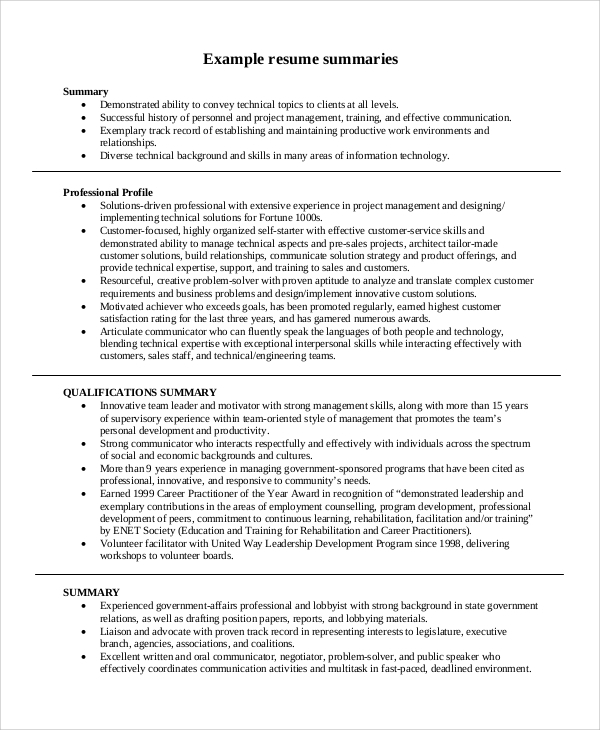 This is a complete instruction on how to write the professional summary for a resume. It shows the difference between a professional and an executive summary. It contains all the action words and great sentences that will intrigue the reader to read the rest of it. 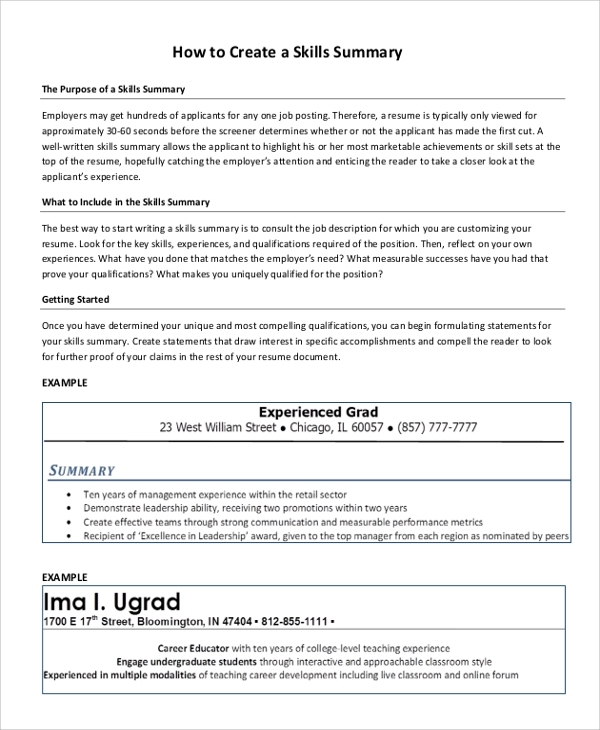 This is an illustration of how to write a personal and professional summary at the beginning of the resume so that it can capture the attention of the reader. It comes with multiple examples to show the ingredients in such a summary. 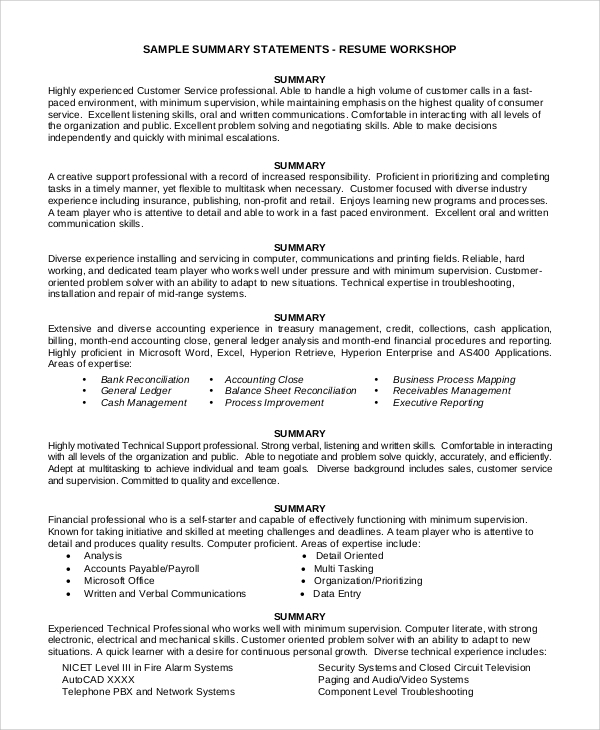 This summary of skills resume states how exactly to list the skills using bullet points create a summary form so that it gets the needed attention in the resume. It states what to include, how to start and the purpose of such summary. It comes with four samples for illustration. 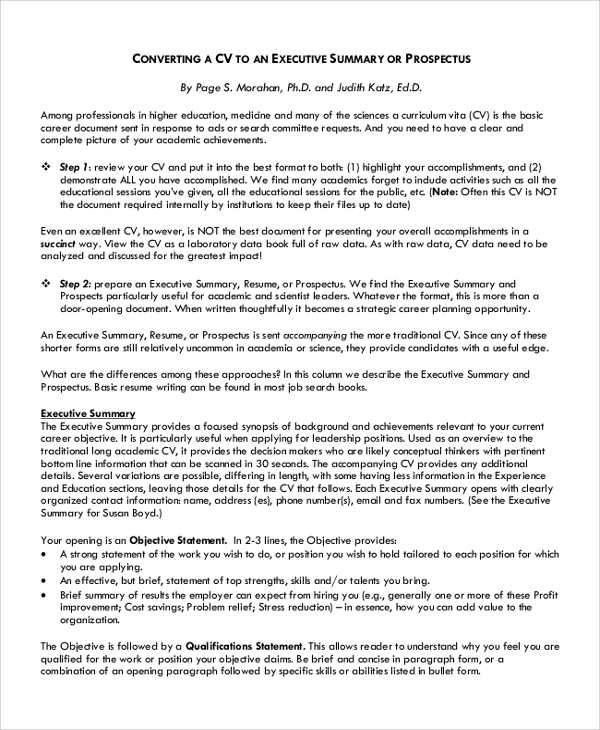 This is a complete manual on how to draft an excellent executive summary of a resume. It lists the steps to follow, the points to cover and the things to keep in mind while writing an executive summary. It provides multiple summary examples and the action words separately. Most people ignore writing the summary at the beginning of the resume. But interviewers always look for such summaries because they point out the qualities of a candidate clearly. Such a summary indicates the passion and drive of the candidate and how suitable and genuine he/she is to deserve the job post. For experienced professionals, their resume must contain an executive or Professional Summary to increase their chances of selection and it should express what exactly they are looking for in a company going forward. All the instructions are provided stepwise with multiple examples. The targeted audiences for these summaries for a resume are the freshers who are willing to apply for a new job. The executive or professional summary will give them the edge over others. Similarly, they can also write a summary of different elements such as qualification, work experience and relevant knowledge and skills beautifully. They are mandatory for the experienced professionals to furnish a resume with an excellent summary. Even students need them while applying for an internship. 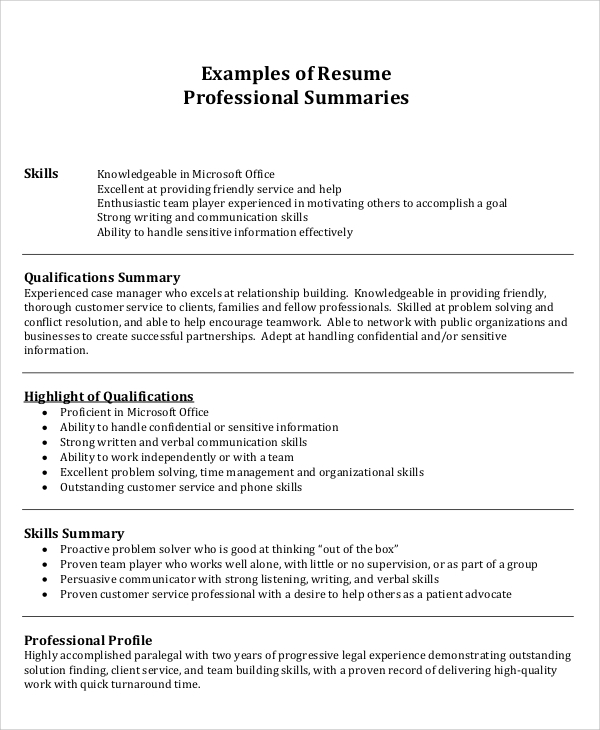 The above-listed summary for Resume Samples have all the steps and instructions mentioned to write super excellent summaries not only for the professional and executive summary but also for qualification, work experience, and other summaries that are needed to make a complete resume that reads flawlessly. They have multiple samples and illustrations to clarify the points well.